Eastern Wholesale Fence LLC was founded in 1971 as a wholesaler and supplier of fence and related products to the fence trade. Our mission then and now is the same. To supply quality fence products at the best price with the best service. We have never competed with our customers by selling direct to end-users. Eastern Fence produces Illusions PVC fencing and railing in Classic White, Beige, and Gray as well as the new and exciting Grand Illusions Color Spectrum (featuring 35 matte finish colors) and the Grand Illusions Vinyl WoodBond line (featuring 5 authentic woodgrains). We will meet any specifications your customers request including special sizes, sections, Mix-n-Match® color and PVC bending. We have a huge library of fencing spec sheets and CAD files available at CADDetails.com for those jobs that require exact specifications. We supply a full line of wood fence, chain-link products, aluminum and steel ornamental products, welded mesh, guide rail and post and rail. If you need fence or related products for any residential, commercial or industrial application, you need Eastern Wholesale Fence. 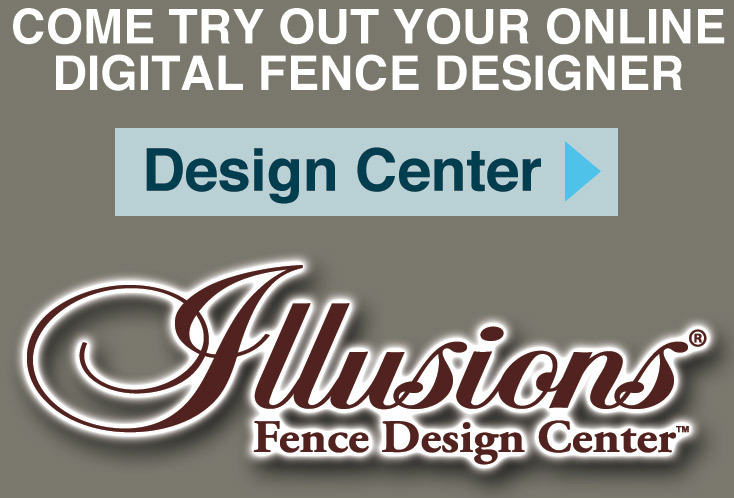 The Illusions Fence Design Center lets you take all 35 Grand Illusions Color Spectrum vinyl fence colors and 5 authentic Grand Illusions Vinyl WoodBond vinyl wood grain fencing colors for a test drive. Create your own install and print out a PDF report. Best of all, it's free and simple to use. Just click the button to get started today!